Poison parsley is another name for hemlock. Hemlock originally attained notoriety around 2500 years ago when it was used to poison the Ancient Greek philosopher, Socrates. He was executed because his teachings were highly critical of the Athenian state and he was a thorn in the side of various high ranking Athenians. And in those days that tended to limit ones life expectancy. I hadn’t knowingly encountered hemlock until a couple of weekends ago when I was strolling around the RSPB reserve at Fen Drayton, where it was lining the hedgrows in some profusion. 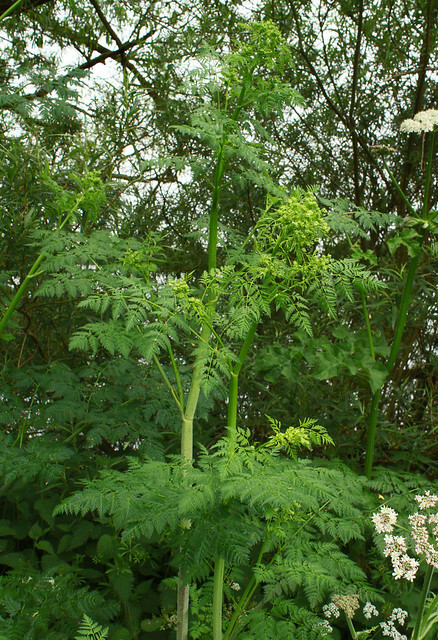 It is an imposing plant that was growing taller than me, up to around 2m, it has dark green feathery leaves and white flowers that resemble the hogweeds. 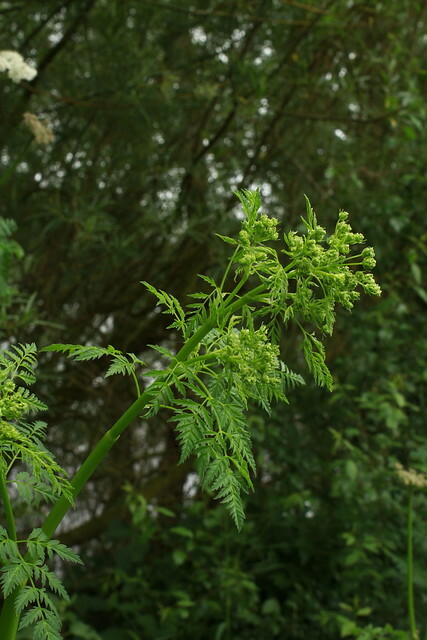 This plant was growing amongst hogweed and cow parsley, and it can appear fairly similar to both, to the uneducated eye. The hogweeds used to provide fodder for pigs, hence the name, but giant hogweed is toxic to humans due to its sap which contains a type of chemical called a ‘furanocoumarin‘ that causes the skin to become sensitive to ultraviolet light. That can result in extremely unpleasant blistering of the skin and blindness if it gets in the eyes. 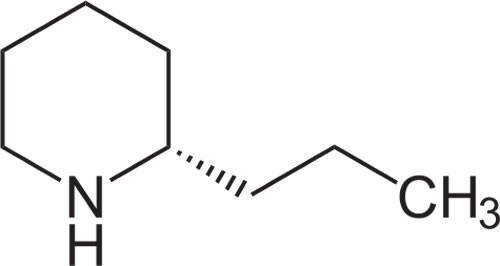 Derivatives of furanocoumarins have been developed as drugs for the treatment of psoriasis. 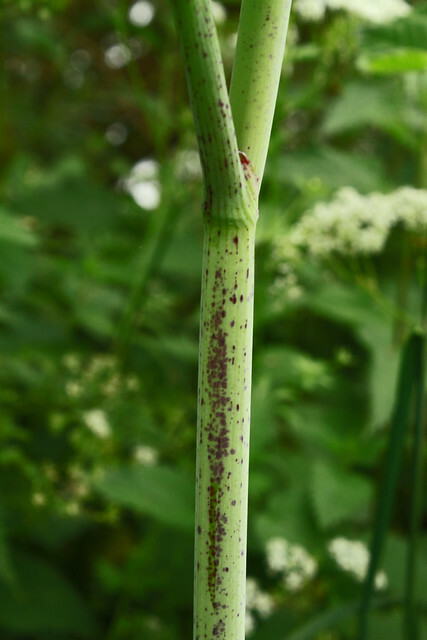 The purple spots on the stem of the hemlock are diagnostic, other similar plants don’t have this, so if you see it, admire it, but don’t touch it! All parts of the plant are toxic and it doesn’t take much to have an effect. Hemlock has a number of names according the the Royal Horticultural Society: California fern, cashes, herb bennet, Nebraska fern, poison hemlock, St Benedict’s herb, snakeweed, spotted hemlock, spotted parsley and winter fern. Also according to the RHS, its range is Europe only, but it has been introduced to the United States, hence the two names which include U.S. states. 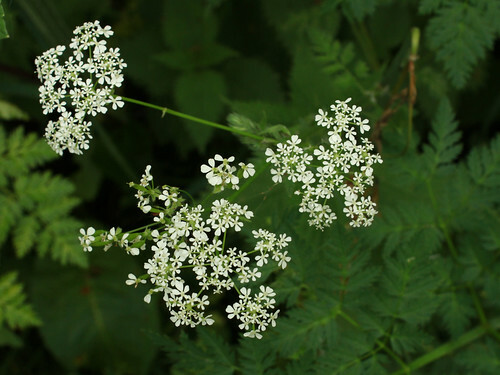 Hemlock grows in damp poorly drained soils and is fed on by various insects including caterpillars and occurs in field borders and roadside verges aswell as along the lakes and ditches where I found it at Fen Drayton. 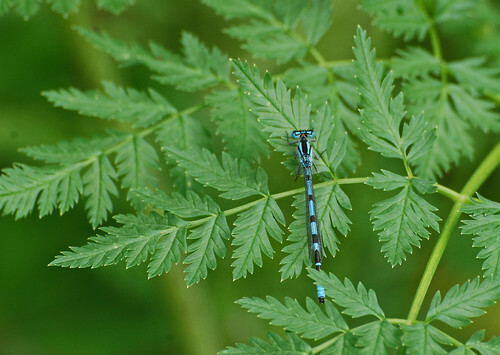 This entry was posted in Countryside walks, Damselflies, Fen Drayton, Fen Drayton nature reserve, Flora and fungi, Insects, RSPB reserves, UK wildlife, Wild flowers, Zygoptera and tagged 2-propylpiperidine, acetylcholine, acetylcholine receptor, alkaloids, Anthriscus sylvestris, California fern, cashes, Coenagrium pulchellum, coniine, Conium maculatum, cow parsley, Crito, Fen Drayton, flaccid paralysis, flora, furanocoumarin, hemlock, Heracleum mantegazzianum, Heracleum sphondylium, herb bennet, hogweed, Nature, Nebraska fern, neurotransmitter, plant toxins, Plato, poison hemlock, poison parsley, post-synaptic membrane, psoriasis, RHS, Royal Horticultural Society, RSPB reserve, snakeweed, Socrates, Socrates' final words, spotted hemlock, spotted parsley, St Benedict's herb, variable damselfy, wild flowers, winter fern. Bookmark the permalink. That blistering sounds mighty unpleasant. I was warned not to go near giant hogweed when I was a kid but it was so uncommon it was’t a problem. But hemlock is fascinating stuff, look out the purple blotches on the smooth stem – they’re diagnostic for hemlock. It’s a splendid plant, especially when it’s at its maximum height. I am not aware that hemlock is indigenous to the area I live (although we do have hemlock trees), but now I would be able to identify it if I did come across it. The purple spots are a good warning sign. Interesting post Finn! 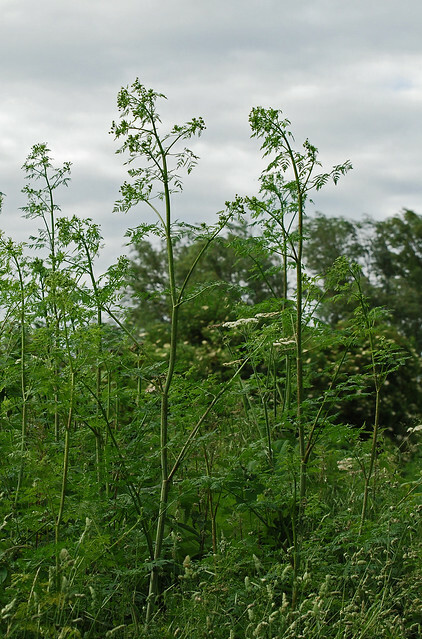 Hello Rick, I had a reply from your side of the Atlantic to say hemlock grows in Texas, but I don’t know if it has always been there or if Europeans brought it with them… although I can’t imagine why they would! Thanks Ruth, it’s an interesting plant with a long history. We have a lot of hemlock around here. I didn’t know what it was until just recently when I went out with the San Diego Beginning Birders and one of our guides told us what the tall, beautiful plants were. Hello Russel, it’s a lovely plant. It’s growing really tall here right now because of the warm wet weather we’ve been having, getting up to it’s maximum height of around 2.5m. It’s an impressive plant. I do apologise, 1m is 3 feet 3 inches, so it’s around 8 feet. I kind of did the calculation in my head since I’m 6’3″ and the hemlock here are taller than me. We have hemlock growing as an alien species in Texas, including along the Colorado River that flows across the middle of Austin. Thanks for the explanation of why the plant is poisonous, even though the toxic molecule is so relatively simple. Delightful plant. Apparently in older legends, the purple streaks on the stem of water hemlock are the marks put on Cain’s brow when he murdered his brother! Hello Theresa, it is an amazing plant and spectacular too, especially when there is a stand of it over 2m tall. Thanks for the legend too, I didn’t know that, and it’s a great story. I think legends like that are important because they reinforce the link between us humans and our surrounding nature. Luckuly we don’t have this, but there are some few in southern Norway..
You’re very welcome, I’m glad you found it interesting. I’m surprised to hear it called herb bennet, I thought that was a completely different plant, with little five-petalled yellow flowers (aka wood avens). Hemlock is a pretty nasty piece of work for rather an attractive plant, isn’t it? I wonder if I’ve been blithely enjoying what I thought was cow parsley when actually it was the killer, hemlock. I’ll have to check the stems more carefully from now on, just by eye of course. Your dragonfly photo is exquisite. Hello Lorna, interesting that you picked up on that. I wondered about that too as herb bennet is something else where I come from too. Maybe the RHS have slipped up? I don’t know, but it does seem a little odd to have the same name for two different plants. Absolutely, I think the RHS must have got that wrong.